Gina asks: What causes SIDS and how can it be prevented? Sudden infant death syndrome (SIDS) is every new parent’s fear. It’s defined as “the sudden death of an infant under age 1 that cannot be explained after a thorough investigation has been conducted, including a complete autopsy, an examination of the death scene, and a review of the clinical history”. In the early 1970s the US government became concerned at the number of infant deaths that couldn’t be explained. This led to The Sudden Infant Death Syndrome Act of 1974 which gave power, and funding for research, to the National Institute of Child Health and Human Development (NICHHD) to find the cause. Fast forward to today and we still haven’t definitively proven what the root cause of SIDS is. However, we do know that it’s most likely the result of a simultaneous occurrence of multiple events- a perfect storm of intrinsic and extrinsic factors that leads to dead babies. This theory seems to be the most widely accepted and was first put forth by Dr.’s JJ Filiano and HC Kinney at Boston’s Children’s Hospital in 1994. Known as the “triple risk model”, it states that in almost every case of SIDS, there are three factors in play- a vulnerable infant, a critical developmental period in homeostatic control, and exogenous stressors. That might sound like a bunch of “doctor speak” for “I really don’t know why your baby is dead” (and yes, I’ll explain it in English shortly), but the truth is, based on this model, the NICHHD came up with an education plan called the “back to sleep” program. The results have helped reduce the cases of SIDS by over 50% since the early 1990s. It might seem like this type of tragedy is now rare and can be overlooked when it comes to what we should worry about with newborns. After all, I would much rather worry about how to keep poop from leaking out the sides of the diaper. (Seriously, it’s gross.) The truth, however, is SIDS is still the leading cause of death in children under the age of 1, accounting for about .67 deaths per 1,000 live births in the US. Because almost no one likes dead babies, let’s look at these three factors and why they come together to form this perfect storm of SIDS tragedy. The first factor in the “triple risk model” is a vulnerable infant. What does that mean? It all comes down to breathing and how the brain controls it. The body has a respiratory center in the brain located in an area known as the Medulla Oblongata and the Pons regions. If you were sleeping (almost all cases of SIDS involve and infant who was sleeping prior to being found dead) these areas get information from what are known as chemoreceptors. These receptors are responsible for regulating our breathing so just the right amount of oxygen gets in, and the right amount of carbon dioxide gets out (despite the voluntary things that control breathing). One of the nerve groups involved with the chemoreceptors (and helps influence the respiratory drive, blood pressure, temperature regulation, upper airway reflexes, and arousal) is called the 5-hydroxytryptamine (5-HT) neurons. They also are responsible for regulating long term breathing in response to low oxygen levels (hypoxia). Several studies have shown that, in almost all SIDS cases, the infant had abnormal 5-HT neurons. Specifically, they had a higher number of neurons and a greater overall neuron density. They also had lower numbers of receptor sites for the neurotransmitters that send the signals to breathe. These abnormal neurons will not work appropriately if the baby was put in a situation where these nerves were controlling breathing, like when sleeping, and the infant was put in a hypoxic state, like lying face down in the crib and breathing into a loose comforter, stuffed animal, pillow or the like. These studies also showed that males had significantly lower numbers of neurotransmitter receptor site binding than females. This is important ancillary evidence, as males are more likely to be a victim of SIDS than females. The second factor in “the triple risk” model is a critical period in the development of homeostatic control. Basically, in English, this means the baby is most likely less than 1 year of age. This is because the period in which the baby is developing the respiratory centers of the medulla are within the first year. “Homeostatic control” is just a fancy way of saying that area is controlling the oxygen and carbon dioxide levels appropriately. The third factor in the “triple risk model” is exogenous stressors. What are those? Anything that might cause the baby to be in a state of hypoxia, or have elevated levels of carbon dioxide in their system. So things like sleeping face down, covering the baby’s head while sleeping, using bulky blankets and pillows, allowing the child to share a bed with others, bundling up the infant too closely to their face, piling stuffed animals or toys around the baby, and illness just prior to death. Among other indicators, evidence that this “triple risk model” is correct can be found in a study published in 2010 in the Journal of the American Medical Association. It showed that 95% of SIDS cases had 1 or more of these risk factors, 88% had 2 or more, and 95% had at least 1 exogenous stressor. So how can you reduce the risk of SIDS in your baby? We can’t know ahead of time if our child has a 5-HT abnormality, and we can’t change that our babies are developing their respiratory centers during their 1st year of life. So the only way for us to try to prevent SIDS is to try and control the exogenous stressors. The “back to sleep” (also known as “Safe to Sleep”) program recommends that you only allow your baby to sleep on their backs. Do not allow the baby to sleep in the bed with you, rather have them sleep in the crib next to you. 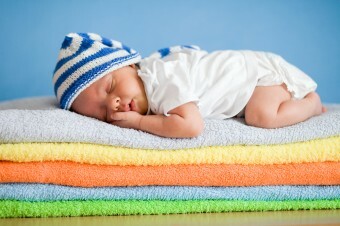 Use only tight fitting sheets and blankets in the crib (nothing loose and otherwise keep the crib empty). Allow for the use of a pacifier, as this will help in the aid of respiratory control. The use of a fan to circulate the air in the room has also been linked with decreased SIDS instances. Stop smoking. There is a 2-5 fold increase in the risk of SIDS if the mother smokes. Finally, breast feed or otherwise feed your baby breast milk any way you can. Beyond the numerous other proven benefits of this over formula, several studies have shown up to a 50% decrease in the risk of SIDS if the baby is breastfed. In the end, to answer your “what causes SIDS” question in a single sentence, the most likely cause of SIDS is an abnormality in the 5-HT neurons that does not allow for the baby to restore appropriate oxygen and carbon dioxide levels while being stressed by outside factors that cause states of asphyxia. Phew! That sentence is a mouthful. Feel free to memorize it so you can impress your friends the next time the “what causes SIDS” question comes up! And then re-read the above full explanation a few times, so you can back up your awesome medically sounding one sentence answer with an English explanation. It should be noted that the “back to sleep” program is not without controversy. It has been theorized that babies sleeping on their back instead of stomach increases the chances of positional plagiocephaly (“flat head syndrome”) and certain jaw problems. Further, while stomach sleeping definitely increases SIDS rates, recent studies have shown developmental and other health benefits with stomach sleeping for babies, presumed to be due to sleeping more restfully and deeply when sleeping this way. Among the benefits, at the 6 month mark babies who sleep on their stomachs have been found to score higher in social skills and gross-motor skills; they also have less neurocognitive abnormalities, less emotional problems, better memory, quicker verbal skills, and in general increased total developmental scores. However, because the difference between back sleepers and stomach sleepers disappears at around 18 months, most experts still think back sleeping is the way to go- better a slightly developmentally delayed baby with flat head syndrome than a dead baby. Not every case of an infant dying unexpectedly fits the definition of SIDS. One example would be if the infant never had an autopsy performed. Because of this, the Centers for Disease Control, and the AAP have taken to saying any unexpected death of an infant under the age of 1 be defined as a Sudden Unexpected Infant Death (SUID). I have to shake my head at the lack of creativity when they came up with that name. SIDS is currently the leading cause of SUID. Other causes include; accidental suffocation, poisoning or overdose, infections, cardiac rhythm problems, inborn errors of metabolism, and lastly- unknown. Approximately 4,500 babies die every year of SUID. 50% are cases of SIDS. 35 to 40 years ago I fostered newborn babies who were up for adoption. I had one “die” in my arms. I don’t know how I knew to do it, but I slipped my hands around her waist and lowered her nearly to the floor and swung her up as fast and high as I could and she sucked in a big gulp of air. I got her to the doctor as fast as I could but he couldn’t find any problem. I often wonder if that child is still alive and healthy. There is definitely a different feel to a live baby and a dead one and if you have never experienced it, it will be hard for you to believe she was really dead. But I know and the doctor believed me. I’ve read, and it makes sense to me, that SIDS is a form of temporary central sleep apnea due to an infant having an underdeveloped ability to sense CO2 levels in their blood, which is primarily what triggers breathing. It’s possible that all infants are, to a degree, at risk of this happening during that critical period in their first year. As a sufferer of central apnea myself, it is a scary condition that can even happen when you are awake. If you are relaxed and not thinking about it, you can suddenly find yourself gasping for air as your brain isn’t monitoring your CO2 levels correctly and triggering a timely respiratory response. An adult with central apnea can die in their sleep, though this is very rare as other triggers generally bring a person out of deep sleep to start breathing. More common are the long term effects of chronic fatigue, angina, tachycardia, increased risk of heart disease, obesity leading to obstructive apnea, and some brain damage due to repeated hypoxia. Currently, there is about as little known of the causes of central type apnea as there is the causes of SIDS. It is possible that finding out a way to treat the one will provide a treatment for the other. As for central apnea, the only current “treatment” is a bi-level CPAP. As it is a neurological condition, this by no means is any kind of a cure, and the CPAP therapy is required indefinitely.